Ironweed is a coarse, perennial plant; the simple, glabrous stem grows 2-10 feet high and bears alternate, ascending, purplish-green, linear or oblong-lanceolate leaves, 4-8 inches long. The reddish-purple or purple flowers grow in dense cymes of short-peduncled heads, somewhat like miniature thistles, from July to September. 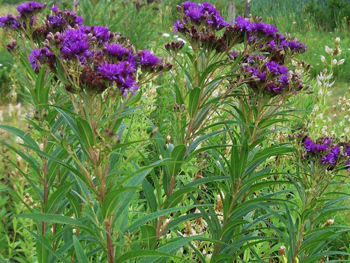 Another variety: Also called ironweed, (V. glauca) is a blue-green perennial, 2-5 feet tall. Leaves are on stems only, not at the base; oval to lance-shaped and narrowly sharp-pointed at the tip and base. Flowers July to October. Seed crowns are yellowish. Found in rich woods; New Jersey to Georgia; Alabama to Pennsylvania. The root used by Native Americans as a blood tonic, to regulate menses, relieve pain after childbirth, and for bleeding, and stomachaches. Grows in woods, on prairies, and along riverbanks and streambanks in the states west of Ohio. The root is taken in the form of a powder or a decoction primarily to stimulate appetite and promote digestion. Useful for female complaints, amenorrhea, dysmenorrhea, leucorrhea, and menorrhagia. A remedy for chills and fevers, scrofula, diseases of the skin, syphilis. A decoction of the leaves is used as a gargle for sore throat. Decoction: use 1 tsp. rootstock with 1 cup water. Take 1-2 cups per day, 1/2 to 1 hour before meals.